When I interviewed Danielle DiMartino Booth on my radio show on March 12, I asked her what the chances are that we would enter a recession in 2019. Without hesitation she said they are very, very high. She said this after noting several issues of weakness in the auto and residential real estate, despite lower mortgage rates. She also noted that the highly regarded Ned Davis Research service has suggested that the probability of a global recession this year is 96%. Danielle additionally pointed out that David Rosenberg assigned a probability of a recession in the U.S. at 80%. I have subscribed to Danielle’s Daily Quill report and I am impressed with the amount of the detailed daily information and chart she provides, documenting her point of view. 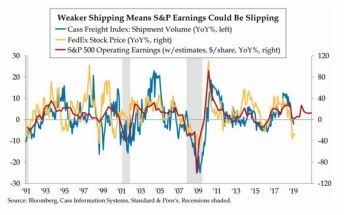 For example, just today she put out the following chart showing a correlation between the Cass Freight Index as well as the Fed Ex stock price and the S&P 500. This would suggest that equity prices may indeed be headed lower despite any efforts by the Plunge Protection Team at the Treasury to manipulate the market higher with purchase of stocks in the futures markets. Danielle suggested that she was sure the Fed will definitely stop QT this year within a few months. As it turns out we learned the discontinuation of QT would not take months because it was only eight days after I spoke to Danielle that the Fed announced they would not raise interest rates again this year. That sent the gold price up substantially in a few minutes. For sure it seems now that the Fed has no choice but to print money like mad, which leads me to one more point Danielle made. Although she said she is the furthest thing from a gold bug, she owns gold because it always does better not only in inflationary periods but even better in deflationary periods of time as well. I should say that all of this is very much in sync with Michael Oliver’s momentum technical analysis. Gold is heading higher and stocks are heading down! Well, it definitely seems that the time has come for the Big Lie sold by Keynesian economists to finally be exposed. The Fed cannot allow true price discovery of capital to be restored without sending our country into the worst depression we have ever experienced! And so, they won’t allow rates to rise, at least not until the powers that be are forced to return to free market capital for capital, much as Russia did after the collapse of the Soviet Union. We are going to have some very difficult times ahead of us and I think a massive decline in the global economy and a massive decline of stocks are on the way. That figures to be very bullish for gold and gold shares, but when it comes to base metals and precious metals like palladium, perhaps not so much if we are entering a global recession.